09/21/2018 – CAD model and design of the micro propulsion testing chamber is completed. 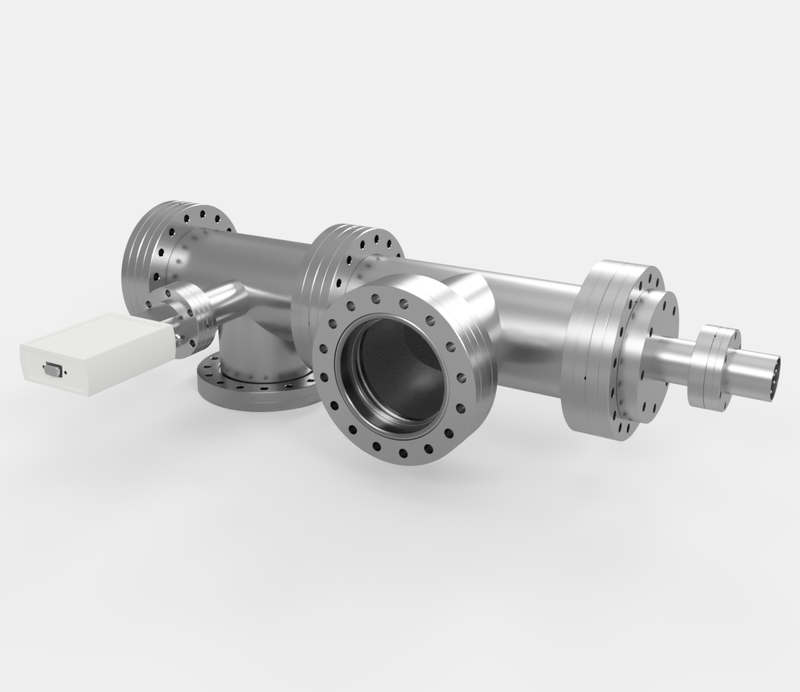 09/27/2018 – CAD model of the micro propulsion test chamber is merged and finalized with the integrated high vacuum test stand. 11/08/2018 – Initial molecular flow calculations on the integrated high vacuum diffusion pump system is completed and verifies viability of 600 L/s pump for reaching desired ultimate pressure of 10^-7 torr blanked off. 11/12/2018 – High vacuum engineering design calculations for the micro propulsion testing chamber is complete. Calculations uploaded to specifications page. 12/08/2018 – Molecular flow simulations using Molflow+ complete. Full simulation overview and results page released. 02/04/2019 – Major components of the chamber cleaned and prepped for assembly. Main chamber and viewport bolted together. 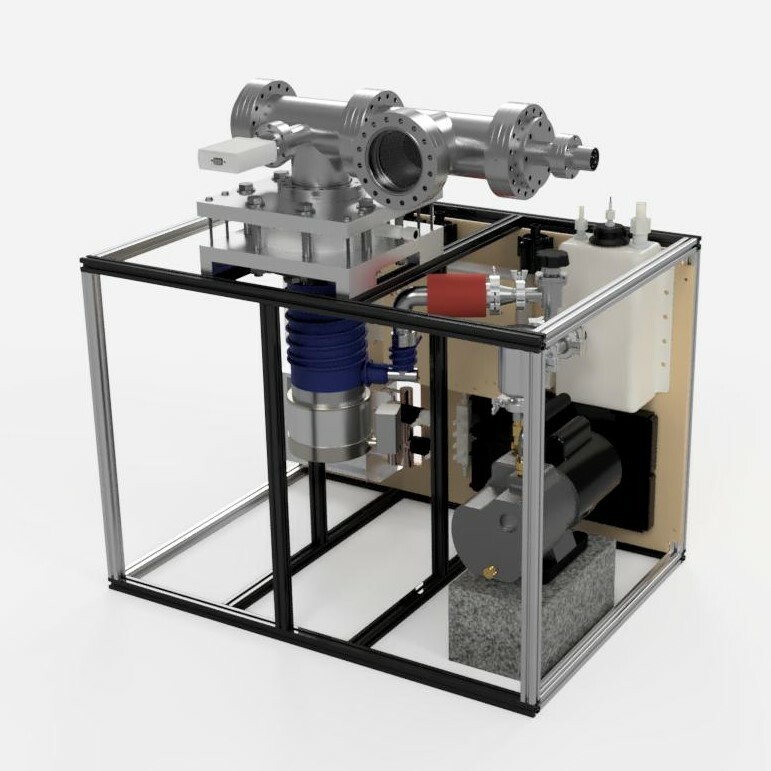 The Micro Propulsion Testing chamber is a compact, low-cost, and highly modular test platform for the research and development of propulsion technologies for space applications. The chamber will primarily be used for the testing and development of pulsed plasma thrusters and ion thrusters for small satellite propulsion, including the range from small PocketQubes, to PicoSats, NanoSats, and CubeSats. The system features a 600 L/s diffusion pump, with capability to upgrade to a much faster 1200 L/s diffusion pump in the future. The high vacuum pumping line is optimized for simplicity, maximum conductance, and pumping speed. 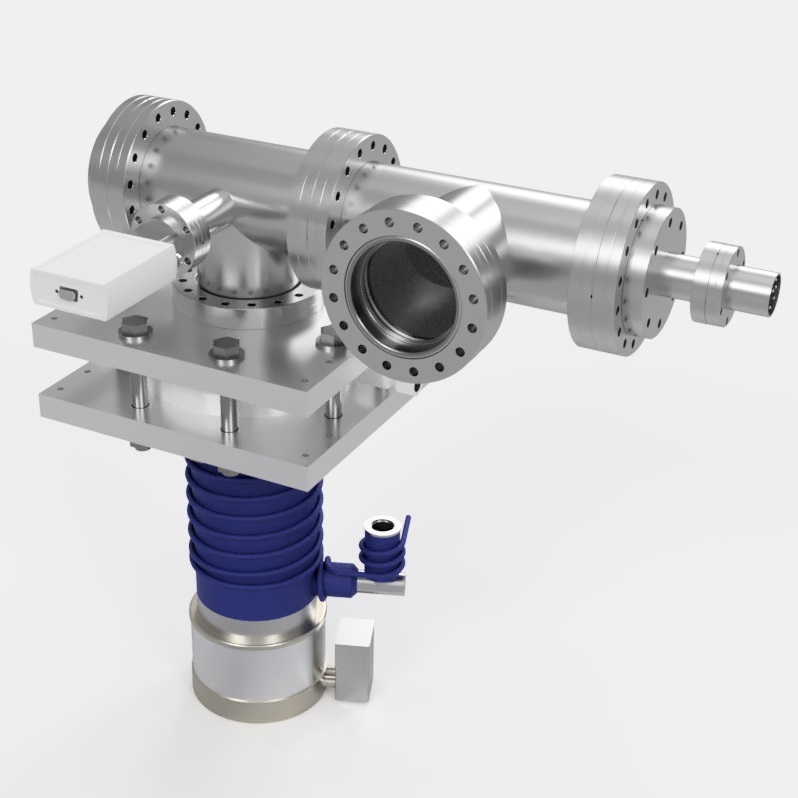 The chamber itself is made from two 6″ conflat tees, with an additional 2.75″ conflat port off the pumping tee for vacuum pressure measurements. The input features a 6-pin high voltage feedthrough for engine inputs. The diagnostic input features a 9-pin feedthrough for a wide variety of propulsion, plasma, and ion diagnostics. In addition, the chamber also features a large optically clear 6″ conflat viewport for direct and full viewing of the engine in operation, placed out of the direct line of engine firing to minimize deposition on the viewport surface. In addition to engine testing and development, the chamber can also be used as a test platform for other groups to run testing of small satellites in high vacuum conditions. This includes general high vacuum testing, thermal cycling, vibration testing, and thruster testing.